REVIEW: "La Cage aux Folles"
That burst of glitter hovering over the Theater District is coming from the national touring company of "La Cage aux Folles," in town for a quick holiday visit. 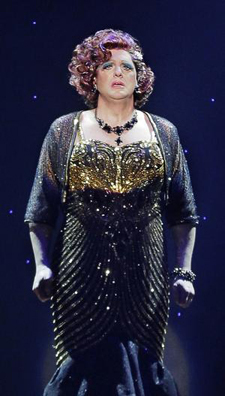 Music and lyrics are by Jerry Herman with a book from Harvey Fierstein. When the now-adult son announces he's about to be married to a girl with an ultra conservative father, Albin finds himself not invited to the festivities. But in the end, Albin steps in to save the day and a happy ending is assured. From the beginning, Jerry Herman maintained that the musical should be colorful and mainstream versus a militant attack on tolerance. Ultimately, the show is about a family. The original production of "La Cage" went on to run for four years on Broadway and win six Tony Awards including Best Musical, Best Book and Best Score (which includes Herman's rousing anthems, "I Am What I Am" and "The Best Of Times," along with the thoughtful ballad "Song on the Sand"). The touring production appears to be relying more on its past reputation than current innovation. Plays and musicals are constantly being re-envisioned and re-invented, from Shakespeare to Sondheim. But in the case of "La Cage," the new vision is vastly stripped down. What's of more concern is that it's being delivered with a mugging campiness that's overdone. Through the years, Laurents was firm about two things. First -- the show should not try to hit the audience over the head with a message. The focus should be on the family, and the lesson would shine through on its own. And second -- the wrong tone could spell disappointment. In this case, the first is fine, the second is in question. Christopher Sieber (at left), who interestingly played the role of Georges in the Broadway revival, is Albin for the touring production. Both tender and fiery, he gives it his all as the father-figure glamazon who finds himself shunned by the boy he helped raise. Sieber is the reason to attend. George Hamilton is Georges, and if Sieber has his energy switch set to a vibrant 10, Hamilton has his cranked back to less than half of that. Which is unfortunate, because he has the aura and Matinee Idol good looks necessary to make the dashing club impresario memorable. Instead, he's pleasant rather than charismatic. As the evening's "host," he needs to bring more to the table than that. The two male leads should be equal partners, but here they're unevenly mismatched. In the shadow of what the glorious original production offered, this one is what it is. 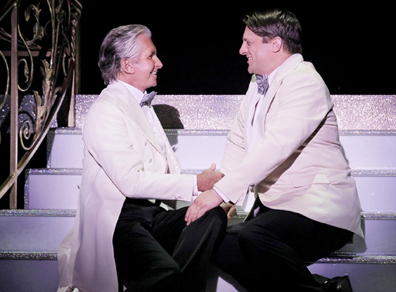 "La Cage aux Folles" is at The Shubert Theatre through December 17. For information, call 1-866-348-9738.